WASHINGTON (AP) — President Donald Trump’s relentless drive to be given credit for all manner of things suffused his speech to Michigan supporters this past week. These efforts are largely familiar by now: He counts job gains from the Obama era as his own, rebrands his predecessor’s veterans health care initiative as a Trump achievement, attributes auto factory expansion long in the making to his leadership, and hails a Republican rescue of health care that has not materialized. He then declared that after decades of failure by lawmakers to get money to clean up the Great Lakes, he was coming ahead with $300 million for that effort. The crowd roared. But the Great Lakes Restoration Initiative was getting that money already . Trump had proposed slashing it. TRUMP, on the care of migrant children apprehended at the border and the Dec. 8 death of Jakelin Caal Maquin, 7, of Guatemala: “I think that it’s been very well stated that we’ve done a fantastic job. ... The father gave the child no water for a long period of time - he actually admitted blame.” — to reporters Friday. THE FACTS: That’s a misrepresentation of the circumstances behind the girl’s death as Trump seeks to steer any potential blame for it away from his administration. An autopsy report released Friday found she died of a bacterial infection just more than a day after being apprehended by the U.S. Border Patrol. The El Paso County Medical Examiner’s office said Jakelin experienced a “rapidly progressive infection” that led to the failure of multiple organs. Neither the autopsy report, nor accounts at the time by Customs and Border Protection , spoke of dehydration. The Border Protection timeline on her case said she was checked for medical problems upon her apprehension and: “The initial screening revealed no evidence of health issues.” And through family lawyers, Nery Gilberto Caal Cuz said after his daughter’s death that he had made sure she had food and water as they traveled through Mexico. He did not say her death was his fault. TRUMP: “I support the Great Lakes. Always have. They are beautiful. They are big, very deep, record deepness, right? And I’m going to get, in honor of my friends, full funding of $300 million for the Great Lakes Restoration Initiative, which you have been trying to get for over 30 years. So we will get it done.” — Grand Rapids rally. THE FACTS: Trump’s recent budget proposal sought to cut federal financing of that program by 90 percent. His comment actually meant that his administration would — presumably — give up its efforts over the last few years to cut the program, which has been receiving about $300 million a year since 2010. His assertion that this money has eluded supporters of the lakes for three decades is wrong. The program is popular with lawmakers from both parties and it was unlikely that the Trump cut would prevail. Also, the Great Lakes are not the world’s deepest, or even among the 20 deepest . TRUMP: “I have overridden my people. We’re funding the Special Olympics.” — remarks to reporters Thursday. THE FACTS: In this instance, unlike in the Great Lakes matter, Trump is acknowledging that it was his administration that had proposed to cut the money, though by blaming “my people” he did not take direct responsibility. In any event, spending is up to Congress, not him. What he means is that the White House is dropping its budget proposal to deny federal money for the games. TRUMP: “We will always protect patients with pre-existing conditions, always.” — Michigan rally. President Barack Obama’s health care law requires insurers to take all applicants, regardless of medical history, and patients with health problems pay the same standard premiums as healthy ones. Bills supported in 2017 by Trump and congressional Republicans to repeal the law could have pushed up costs for people with pre-existing conditions. TRUMP: “The Republican Party will become the party of great health care. ... Republicans want you to have an affordable plan that’s just right for you.” — Michigan rally. TRUMP: “You look at all of the different things, Russia would’ve much rather had Hillary than Donald Trump. I can tell you that right now.” — Fox News interview Wednesday. The Republican-led Senate intelligence committee last year said it agreed with the U.S. intelligence agencies’ assessment that Russia intervened in the 2016 election to hurt the candidacy of Democrat Hillary Clinton and help Trump. TRUMP: “After three years of lies and smears and slander, the Russia hoax is finally dead. The collusion delusion is over. The special counsel completed its report and found no collusion and no obstruction. ...Total exoneration, complete vindication.” — Michigan rally. THE FACTS: Special counsel Robert Mueller did not vindicate Trump in “total” in the Russia probe. The four-page summary by Barr notes Mueller did not “draw a conclusion — one way or the other — as to whether the examined conduct constituted obstruction,” but rather set out evidence for both sides, leaving the question unanswered of whether Trump obstructed justice. Barr wrote in the summary that ultimately he decided as attorney general that the evidence developed by Mueller was “not sufficient” to establish, for the purposes of prosecution, that Trump committed obstruction. TRUMP, speaking about allegations in a so-called dossier about contacts between Russia and the Trump campaign during the 2016 election: “It came out after the election and everybody had a big fat yawn. ...All of the sudden I hear, ’Were you involved with Russia? I say, ‘Russia? What the hell does Russia have to do with my campaign?’” — Michigan rally. THE FACTS: Russia actually had plenty to do with Trump’s campaign. According to U.S. intelligence agencies and lengthy indictments brought by Mueller’s team, Putin ordered a multipart influence campaign aimed at hurting Clinton’s candidacy, undermining American democracy and helping Trump get elected. TRUMP, on diversity visas: “They are giving us their worst people.” — Michigan rally. TRUMP: “We have created, since my election, 5.5 million new jobs. Nobody would have believed that was possible.” — Michigan rally. THE FACTS: His number is about right, but he’s counting jobs created before he became president. And the progress does not defy belief. The economy created about 6 million jobs in the roughly two years before the election, then again in the roughly two years after. TRUMP: “They’ve been trying to get VA Choice for over 40 years. Couldn’t do it. I got it. We signed it six months ago.” — Michigan rally. Now, starting in June, they are to have that option for a private doctor if their VA wait is only 20 days (28 for specialty care) or their drive is only 30 minutes. 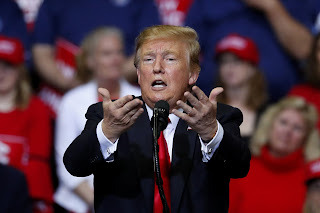 TRUMP: “Instead of waiting online for one day, one week, two months ...now they go outside, they see a private doctor, we pay the bill, they get better quickly.” — Michigan rally. And the expanded Choice eligibility may do little to provide immediate help. That’s because veterans often must wait even longer for an appointment in the private sector. Last year, then-Secretary David Shulkin said VA care is “often 40 percent better in terms of wait times” compared with the private sector. In 2018, 34 percent of all VA appointments were with outside physicians, down from 36 percent in 2017. Associated Press writers Ricardo Alonso-Zaldivar and Chad Day in Washington and Tom Krisher in Detroit contributed to this report.